Last week I reached out to Jim Hesketh, the president and CEO of new gold explorer Viva Gold. We talked about the company’s latest drill results, why Nevada is such a great place to do business, and what’s next for the company going forward. 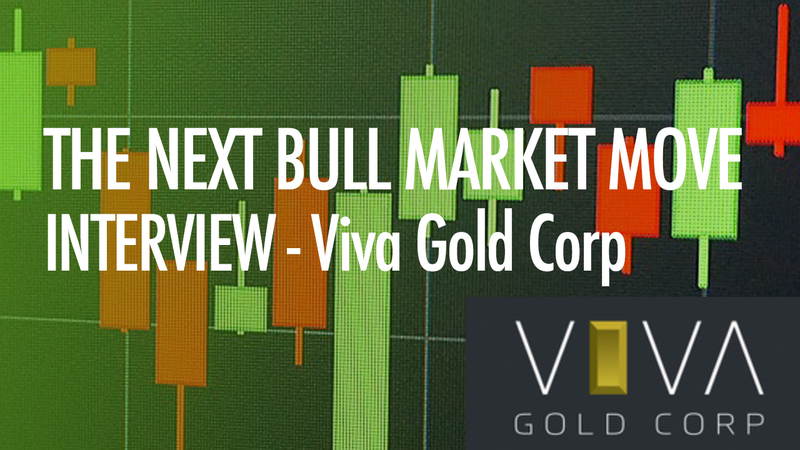 On The Next Bull Market Move we have a brand new guest - we have Jim Hesketh, who's president and CEO of Viva Gold. How are you today Jim? Very good, thank you. How are you today? Viva Gold is a new company, it was a capital pool company that we moved on to the Toronto Venture in November of 2017. We activated the company by completing a qualifying transaction, which was the acquisition of the Tonopah Gold Project, raising $1.1 million in capital and bringing in 100 new shareholders. We have been in existence for just over a year at this point. I had had my eye on the Tonopah Gold Project since a due diligence review back in 2007. I had felt in 2007 that the project was not being correctly analyzed. The property became available for acquisitions as part of the bankruptcy estate of Midway Gold. It is a large system, so I had kept a very tight eye on it, and when I saw it in the portfolio of assets for sale, that's when we moved. As part of the acquisition, we were able to renegotiate the royalty structures. Previously, there had been an index royalty on the project that was capped at a 7% NSR, that's a net smelter return royalty, at $700 gold. A royalty at that level changes how you look at a project. We were able to renegotiate the NSR to a 2% flat NSR with 1% buy out option for a million dollars. So, effectively we have a 1% royalty, versus a 7% royalty, and that changed the way that we look at this project from an economic viewpoint. Getting back to my personal background, I am a mining engineer and a mineral economist. Both degrees from the Colorado School of Mines. I have been in the mining business for 40 years, and I've built and managed a number of mining operations over that time. Let's move on to a very recent piece of news regarding your current drilling program. Can you share with us some details about this and what this may mean for the company going forward? And from my understanding, your goal with this recent drilling program is to essentially expand your current resource to over a million ounces? Is that correct? That's correct. We believe that this project has the potential to become a million ounce project. This project had been drilled in the past by a number of quality operators, who were looking at the nearby Round Mountain deposit as a model for their exploration on the Tonopah project. The first discovery hole was by Kennecott which is now a subsidiary of Rio Tinto. In 1993 they drilled 13 meters and 8 and a half grams per tonne in the Discovery zone of the Tonopah Project. They had targeted it on the basis of extensive geophysics since the property is a covered target with only a single outcrop. Their work was followed up by various other companies, including Newmont who pick up the property in 2002 as part of a regional Walker Lane portfolio review. They did extensive geophysics, outlined additional targets, and outlined the bulk of the resource that's on the property today. After Newmont, Midway Gold worked on the project with a focus on a number of high grade structures that are present on the property. Their intent was to develop a small high grade underground project. Midway spent the past 13 years drilling on structures, while not looking at the entire project potential. What we've done is to go back to the Newmont model of looking at this as an open pit opportunity. The majority of the known mineralization is within 150 to 200 meters of surface. We are currently infilling the gaps between the structural drilling that Midway had focused on and we are producing great results with this program. We see quite a bit of expansion potential for the Tonopah project. There are two deposit types at the Tonopah project. One is the high grade structural type, the other type of mineralization is more of a blanket type mineralization that is associated with a unconformity that exists between an underlying Ordovician age argillite and overlying tertiary volcanics. That unconformity provided a good fluid channel that allowed the deposition of mineralization in a blanket like form, in the top of the argillite and in the bottom of the volcanics, and in other favorable hosts within the volcanics. The blanket type mineralization is our primary target, but because we are drilling angled holes, we're also hitting the high angle structure, so you see both low grade and high grade intercepts in our releases. For the most part what we are targeting is to fill in large gaps between structural zones throughout the deposit. Let's move on to the infrastructure of where you're based. You're based in Nevada, so why is Nevada a good jurisdiction for explorers in general? Yes, Nevada is a mining state. We're just 30 miles, about 50 kilometers, from the Round Mountain gold mine, which in Kinross’s flagship property. We are actually on the road that leads directly to that mine. The formerly mined Manhattan district that is about 15 kilometers up the road, and we are 20 miles from the town of Tonopah, where over 2 million ounces of gold and millions of ounces of silver were mined there in the early half of the last century. We are in a prolific mining district, which has a solid mining infrastructure. Our project is located just off paved roads, a county road and a state road, and we have close proximity to power. There is a power line no more than 2 miles away and there is ample water available in the valley. So we have everything we need there to move a project forward, and to do permitting. The regulatory environment is strong, we have well educated and very competent regulators, and that's always a joyful combination to work with. Nevada is an excellent place to do business. Some highlights for the company that stood out for me were the following. That you have a tight capital share structure of only 20.8 million shares outstanding, and that you actually acquired the Tonopah asset in a bankruptcy sale, which you mentioned briefly earlier. To me this spells opportunity in terms of being a contrarian, buying assets in an environment where gold is not necessarily doing very well at the moment. So could you talk to me about the opportunity you have here? It's the old adage: buy low, go high. We had the opportunity to pick this project up at an excellent price. Over my career I've kept an eye on what I view as good projects, and as you move through these gold cycles, the opportunity to acquire these assets often present themselves. This one did. We picked the Tonopah project for about a dollar sixty per contained ounce, based on our maiden resource which was estimated using historic drill information. We now have a database with over 650 drill holes, representing 90,000 meters of drilling. About half of that drilling is on the main resource zone, the rest is on two other prospects as well as over a 20 mile stretch of the Walker Lane/ Rye Patch trend. We have a lot of recon drilling information, geophysics, and rock chip sampling data. Detailed review of this information is likely to develop additional exploration targets. The work completed in this project was performed by majors like Newmont, and Kennecott. We inherited that entire database as part of the package. As a result, we have a lot of upside, based on information that we currently own. 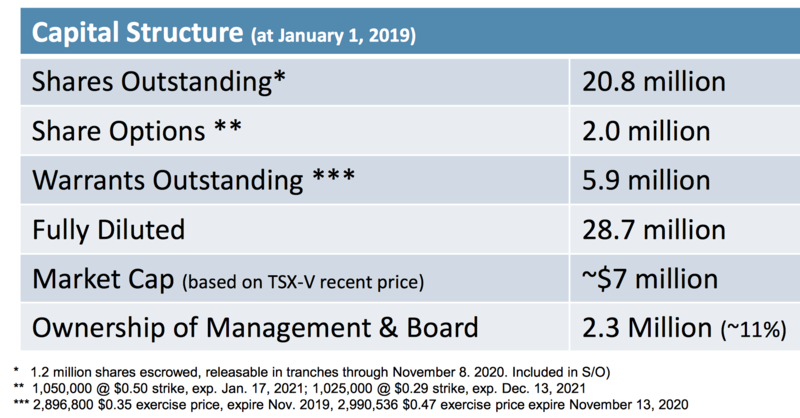 Being a new company, we've been able to keep the capital structure very tight, only 20.8 million shares outstanding and there's about 5 million warrants. We have a lot of runway with this company to move forward and build value. So as a final question Jim, overall, how would Viva Gold stack up when compared to other explorers? Is there a disconnect between what you have and the current value the market is giving your assets? And also what plans do you have for the rest of the year? We believe that we are currently valued at about one third the value per ounce, in the ground, that we see in relationship to other explorers and developers in Nevada. This gives us healthy room to continue to gain in value. Being a new company, we are not well known and we understand the need to continue to build visibility. This work should result in create increased liquidity in the market. As that ball continues to roll forward, we believe that our valuations will continue to increase with on-going exploration success. Fortunately, we believe that have a property which will accommodate that. In terms of our current goals, we're continuing to drill on the project. We have four more drill holes that are currently being assayed and we plan to drill an additional four holes in this program. We're also doing some metallurgical test work, which will add to our news flow. Once this current drill program is completed, we plan on updating the resource estimate. We have drilled over 26 new drillholes since our last estimate and a number of these holes had strong results. This additional information should help us to expand our resource base. Thank you very much for your time today Jim. Much appreciated. And I'm sure we'll have updates throughout the year. All right, thanks Kerem, it was a pleasure talking to you today.